If you've grown tired of winter as we in Seattle have, and the colors we associate with it; the grays, browns, off-whites and earth tones that have dominated the design scene in recent years, you're in for a treat. 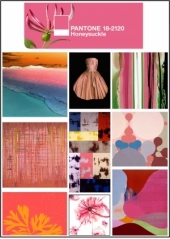 The color gurus at Pantone have declared Honeysuckle, a warm, sunny reddish-pink shade, the color of 2011. Not a timid tint, honeysuckle is “encouraging and uplifting” and perfect for warding off economic doldrums and winter blues.